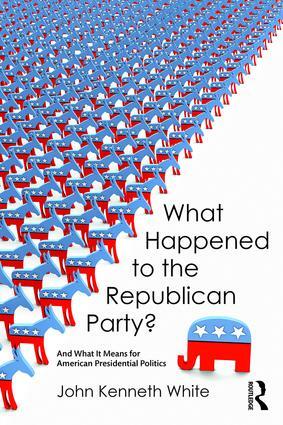 "John White's What Happened to the Republican Party? is an enjoyable, must-read for every American who truly cares about the country's future. White teaches us the inescapable truth that American political parties are mostly either seeking and welcoming converts to their side or instead hunting down and banishing heretics from their ranks. Republicans in 1980 following the lead of Ronald Reagan threw open the doors and invited in disaffected Democrats and independents -- just as the Barack Obama-led Democrats would 28 years later -- but the contemporary GOP has been very much in a heretic-banishing mode and Republicans have paid the price by losing the popular vote in five of the last six presidential elections. If, and only if, Republicans heed the wise counsel of John White in this book, then 2016 could be the first time in 12 years that the GOP wins the White House. Democrats can learn from John White just how tenuous their presidential advantage really is and what they better do about it. Nobody analyzed and understood--and consistently as well as correctly predicted the outcome of--the 2008 and 2012 presidential elections better than John K. White. Reading What Happened to the Republican Party? will make you the smartest political pundit about 2016 in the room." "John White, a well-established authority on American politics and political parties, has written a first-rate analysis of the Republican Party's current struggle to find a political ideology that is consistent with both its historic role as a party of limited national government and the need to offer solutions to pressing economic and social problems." "While Democrats can hardly afford to be complacent, John White lays out in detail the problems Republicans face as they try to put together a presidential majority in 2016. How the Republican Party solves its many problems will affect all of us for years to come." "John White writes a compelling narrative about a Republican Party that has lost its national majority because of a conservative straitjacket that blocks it from opening up to a very new America and a role for purposeful government. He is right that America needs a Republican Party that can balance individualism and community and become electable again." "John Kenneth White’s new book accurately indicates the challenges -- demographic, generational and ideological -- facing the Republican Party in presidential politics today. White also demonstrates how the GOP’s recent successes in recent midterm congressional and state elections can actually work to the Republicans’ disadvantage in securing the White House. This book is essential reading for all those interested in contemporary electoral alignments in the US and for all Republicans who are interested in winning the presidency in 2016." "John White was shrewd in understanding, early on, the interaction of the Reagan and Clinton coalitions. He was on top of the impact of the Obama coalition. So Republicans should take his analysis and his warnings in What Happened to the Republican Party? very seriously. An important book by a wise and prescient scholar." John Kenneth White is a Professor of Politics at the Catholic University of America and the author of several books on political parties and the U.S. Presidency.